Adina Klein from Tahki Stacy Charles is a regular guest expert of Knitting Daily TV. On Series 600 she shared her tips for knitting with cotton yarns and styling cotton knits for year-round comfort and style. Tahki Yarns has created great new scarf designs to add an on-trend punch of color to your wardrobe. 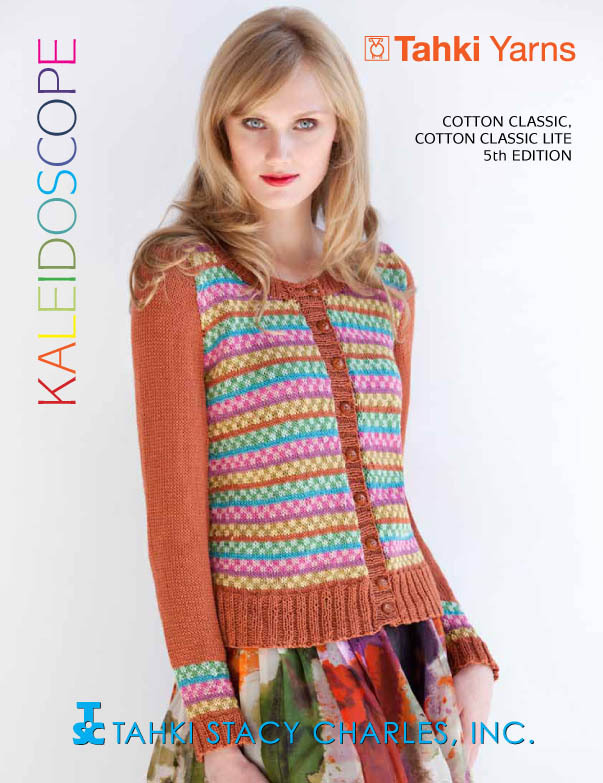 Their new Kaleidoscope pattern book (image on left) features 14 knit patterns in Cotton Classic and Cotton Classic Lite, including the 3-skein scarf designs (below) that combine bright tones with delicate lace patterns. And with 135 shades, you can easily show your personality in your signature colors. Click here to see the Cotton Classic color card. What color are you adding to your wardrobe this year? Punch up your girly-side with bright fuchsia pink, or play up your sophistication with a rich navy. Comment on this post before noon on Wednesday, March 30, and let us know which color you'd choose (be specific, please). When you comment, you'll automatically be entered in the Cotton Classic yarn giveaway! 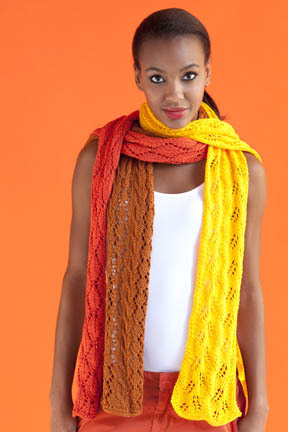 Tahki Yarns is generously providing three Cotton Classic kits to knit your own scarf. 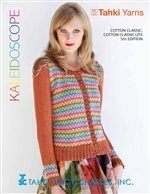 We'll randomly choose from three winners to receive three skeins of Cotton Classic in the color of your choice, plus the new Kaleidoscope pattern book. And check out more of Adina Klein and other yarn experts on the newest season of Knitting Daily TV, now available on DVD. This blog post has been sponsored by Tahki Stacy Charles. For more information on the yarns seen in Adina's segments, as well as Cotton Classic yarn and patterns, visit www.tahkistacycharles.com.